Item shown above : Oak Finish with a glossy protective lacquer. (Magazine not included). 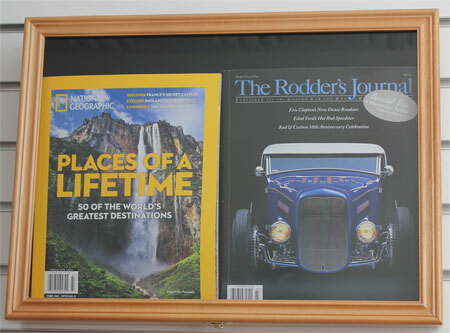 This display case would be a great way to display a magazine or book up to 1" thick. Felt Background create a lovely display contrast. Brass hinges, door latches, and wall brackets. Hinged glass door to protect from dust and damage. Brackets on the back of the display case makes it ready for hanging.